It’s winter in Spain, there is no escaping that fact, and the past two weeks have been unsettled, wet and cold. In addition, at school, every teacher seemed to have some sort of lurgy, so it is not surprising that both Andrew and I have been fighting off colds. This weekend, Andrew has finally succumbed, so today he required a bit more TLC than normal, so what better than chicken soup? 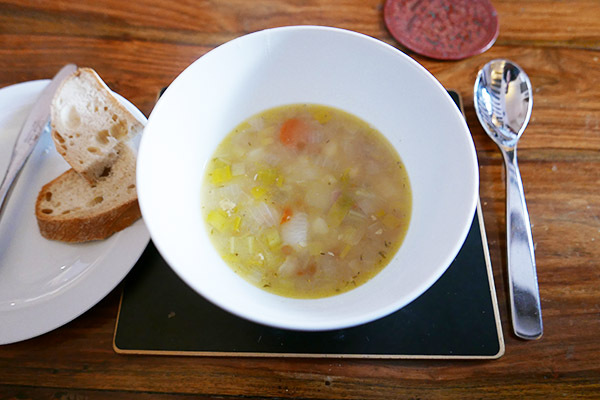 In the UK, I used to make soups out of the carcass of chicken or duck whenever we had had a roast lunch, so today’s soup was an exercise in using the ingredients that are readily available in Spain. Chicken wings here are both plentiful and cheap, so are ideal for making soup, or for throwing into paella. A leek, washed and sliced. I had some jamón to hand, and you could add smoked bacon or ham just to add a bit more flavour. Once the chicken wings have been browned, add all the chopped vegetables, season well with salt and pepper and a sprinkling of dried thyme. Stir well to get the contents coated in oil, then put the lid on the pan and just allow the vegetables to ‘sweat’ a little over a low heat. Make up around 2 pints of chicken stock - I use good quality stock cubes, to be honest. Let the veg sweat for about 5 minutes then add a good slosh of white wine followed by the stock, and then throw in a bayleaf. Now, if you are adding some pulses, check the cooking instructions. If they are dried, some will be suitable to just be added t the soup, but will need to be cooked for an hour at least. Some mixed packs require you to soak these overnight, which is a complete faff! We had jars of ready-to-use lentils and beans, so these could be added right at the end. I cook the soup gently for an hour, and then taste it. Adjust the seasoning as you see fit; might need a little more stock cube, or even a touch of Marmite. You can always leave the lid off and boil the soup for a while longer to reduce the liquid content and intensify the flavour. If you are using ready-to-use pulses, slap a quantity into the soup about 5 minutes before serving. As I have said before, I rarely measure a thing, and this is a prime example. Soups are just great for using anything you have in the cupboard, so there are no hard and fast rules. This soup was, it has to be said, one of my better ones! Brought instant relief to Andrew's cold! After this, Andrew's cold just disappeared. Almost.